My interest is long leases for executives, students, and researchers. You better hotel and much cheaper. The apartment has all you need, bed linen, table and bath, household utensils, pots, dishes, glasses, bowls, coffee maker, sandwich maker, blender, microwave, refrigerator, stove, boiler, washing machine and split in room with hot and cold air. The hiring is effective only with the 30% deposit to block dates, customers in equal dates hiring will be the first to deposit. Our apartment does not have cleaning or laundry service this can be contracted through direct financial agreements with the professional taking no responsibility of the owner. Special rates for rentals over 6 months. This is a family condo, has standards for the use and interaction of residents and the contractor guest undertakes to follow them and doubts may be resolved in the administration. AMAZING EXPERIENCE. YOU MUST STAY HERE!! We had a perfect experience staying here in Porto Alegre. First, Milton was an unbelievable host. He was one of the nicest people I have ever met. He was incredibly responsive to emails before the trip and he met us very late at night after our flight arrived to give us the keys and get us settled. Milton lives in Gramado a few hours from Porto Alegre. We visited for a day and he took several hours to drive us to places and show us around his city. I can not say enough about how amazing he was. 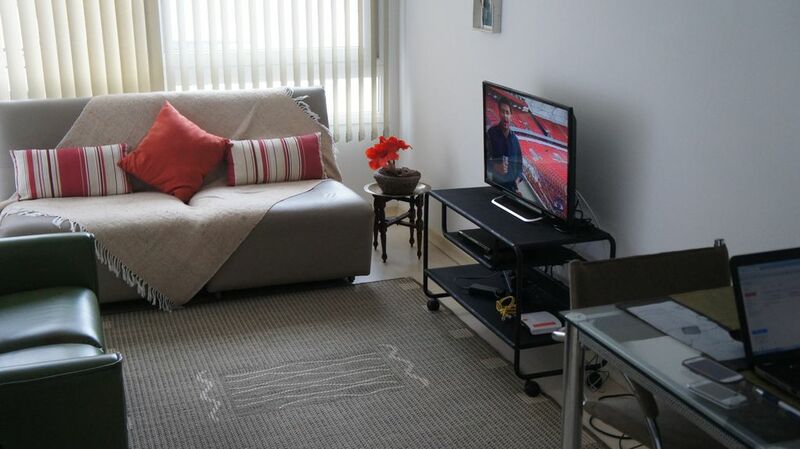 The apartment in Porto Alegre was fantastic. It could not be in a better location. Rua Lima e Silva is the main street in Cidade Baixa which I think is the best neighborhood in the city. The street is filled with awesome bars and restaurants. And it is only 1 block from the grocery store which was very convenient. Even though there is so much happening on the street, the apartment was still nice and quiet. The building has 24 hour security and a garage if you need it and the doormen were very helpful. Everything was incredibly clean. The apartment has as bedroom with a full size bed and Milton got us two twin sized beds in the living room as we had 4 people. The kitchen and bathroom are also nice. As shown in the pictures, upstairs there is a nice Cinema which we used to watch soccer games. There is also a fitness facility which was awesome to use to work out. The pool is quite beautiful, though we were there in the winter so it was a bit cold. It is on the roof which has some incredible views of the city! Overall, I highly recommend staying here! The location, security, and cleanliness of the apartment combined with an amazing host make this a PERFECT SPOT. I can not be happier to have such a friendly and kind review like this. My guests 4 young Americans extremely polite, courteous and left my apartment completely in order. I think they took were very fun and very attentive to me when we ride on Gramado and even invited me to a wonderful lunch at one of the best restaurants in the area. I can only thank these young people and to Matt and Jack in particular because I had more conversations with these Spanish / English / Portuguese, and mixed everything together. In understud very well. I thank you all and I always receive them with a pleasure. Thank you all. Excelente ubicación del edificio, cerca de bares, supermercados y principales líneas de colectivos. El edificio en sí también excelente, seguridad las 24 hs, piscina, gimnasio, todo en muy buen estado. El departamento en sí muy bueno, con los elementos necesarios para poder cocinar y limpiar, cuenta con muy buenas sábanas y toallas. Milton y su esposa estuvieron siempre a disposición por cualquier cosa. Excelente apartamento, completo. Condominio seguro, bem localizado e com varias areas de lazer. Seu Milton também é muito simpatico e atencioso. Nathalia, agradeço imensamente a sua avaliação, fico bem feliz em tê-la como hóspedes, é um prazer ter uma doutora tão jovem agitando muito na sua profissão. Parabéns e muito sucesso. Fico muito agradecido pelas suas palavras, mas devo lhe dizer que foi um prazer conhece-lo e alugar este apartamento para você, uma pessoa extremamente educada, fina e de bom gosto pois tratou o apartamento como se fosse sua casa. Agradeço e me sensibilizo estarei sempre pronto a tê- lo de volta. Faça uma boa viagem e espero que tenhas aproveitado bem o seu curso. Mobiliário bem distribuído e completo, prédio com ótima infraestrutura e muito bem localizado. Ótimo, fiquei muito satisfeito com a sua gentileza em seus comentários. Um jovem muito educado, deixou o apartamento todo limpo e arrumado e ainda mais gostou muito do bairro. Obrigado mais uma vez, estarei sempre pronto para recebê-lo. Ótimo apartamento, mobiliado, bem decorado, pintura em bom estado. Muito bem localizado, próximo a hipermercado, farmácias, restaurantes e bares. O prédio conta com uma excelente infraestrutura, piscinas, academia, cinema, salão de festas e outras mais. The city Baixa is a traditional neighborhood of Porto Alegre, where artists, intellectuals and funky people live. It is a charming place with lots of leisure and services. People from all tribes, foreign tourists and lots of fun and nightlife. Young, middle aged and experienced adults love it. It's great to be there. The Condominium has a biometric identification system, 24 hour doorman. As tarifas padrão são exigidas pelo site, são estimativas e não contemplam as datas especiais, tais como, reveillon, carnaval, páscoa, férias de julho, congressos, todas as datas deverão ser consultadas via email e aprovadas pelo proprietário e solicitante. Nossos preços variam por número de hóspedes, adultos, crianças e o número de dias solicitados.